New research from stem cell biologists at Harvard University demonstrates the ability to turn one type neuron into another within the brain of young mice, possibly providing another step towards the treatment of neurodegenerative diseases. A new finding by Harvard stem cell biologists turns one of the basics of neurobiology on its head by demonstrating that it is possible to turn one type of already differentiated neuron into another within the brain. The discovery by Paola Arlotta and Caroline Rouaux “tells you that maybe the brain is not as immutable as we always thought, because at least during an early window of time one can reprogram the identity of one neuronal class into another,” said Arlotta, an associate professor in Harvard’s Department of Stem Cell and Regenerative Biology (SCRB). The principle of direct lineage reprogramming of differentiated cells within the body was first proven by SCRB co-chair and Harvard Stem Cell Institute (HSCI) co-director Doug Melton and colleagues five years ago, when they reprogrammed exocrine pancreatic cells directly into insulin-producing beta cells. Arlotta and Rouaux now have proven that neurons too can change. The work is published online in the journal Nature Cell Biology. Their experiments targeted callosal projection neurons, which connect the two hemispheres of the brain, and turned them into neurons similar to corticospinal motor neurons, one of two populations of neurons destroyed in Amyotrophic lateral sclerosis (ALS), also known as Lou Gehrig’s disease. To achieve such reprogramming of neuronal identity, the researchers used a transcription factor called Fezf2, which long has been known for playing a central role in the development of corticospinal neurons in the embryo. What makes the findings even more significant is that the work was done in the brains of living mice rather than in collections of cells in laboratory dishes. The mice were young, so researchers still do not know if neuronal reprogramming will be possible in older laboratory animals, or in humans. If that proves possible, the implications for the treatment of neurodegenerative diseases could be enormous. The work in Arlotta’s lab is focused on the cerebral cortex, but “it opens the door to reprogramming in other areas of the central nervous system,” she said. 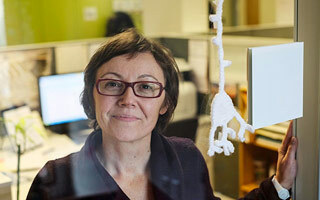 Arlotta, an HSCI principal faculty member, is now working with colleague Takao Hensch of Harvard’s Department of Molecular and Cellular Biology to explicate the physiology of the reprogrammed neurons, and learn how they communicate within pre-existing neuronal networks. “My hope is that this will facilitate work in a new field of neurobiology that explores the boundaries and power of neuronal reprogramming to re-engineer circuits relevant to disease,” Arlotta said. The work was financed by a seed grant from HSCI, and by support from the National Institutes of Health and the Spastic Paraplegia Foundation. 1 Comment on "Stem Cell Biologists Turn One Form of Neuron into Another"